Westerners have trouble understanding the Chinese, and they have trouble understanding us. Our languages are very different-- Chinese writing is ideographic rather than alphabetic, and there are no common word roots to help in learning vocabulary. But the problem is deeper. The Chinese culture is very different from ours, for it rests on fundamentally different assumptions about life. 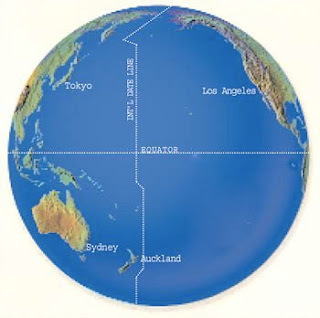 There are huge differences between Western and Eastern thought, especially regarding concepts of interpersonal harmony and interfamilial fealty, still there are similarities. Confucius offered a version of the "Golden Rule": If something is hateful to you, do not do it to other people. 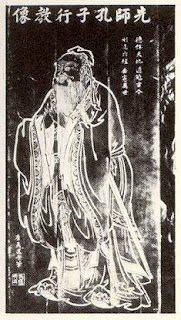 Above: Image of the sage imposed on a page from the Analects. 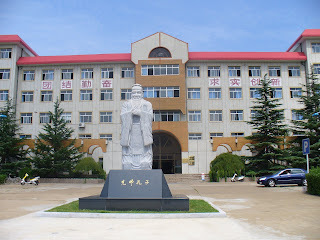 Below 1: A statue of Confucius stands before the School of Interpretation and Translation, Shandong University at Weihai. Below 2: View from the balcony, Kongzi Academy of Nanjing. What a great experience you must be having going to China. I hope you get to continue going and learn more about their culture.